However, some economists argue that in the current situation, the ECB should have a higher inflation target of 3-4%. The main reason for having a higher inflation rate would be to prioritise economic growth and help to reduce unemployment. Higher inflation would also help to contain and reduce government debt to GDP ratios – without excessive austerity. Having a higher inflation rate will be resisted by many other economists and Central Bankers who believe that allowing higher inflation will lead to costs of uncertainty, lower investment and greater instability in the long-term. (see: costs of inflation) Also, some doubt whether higher inflation will actually help real economic growth. 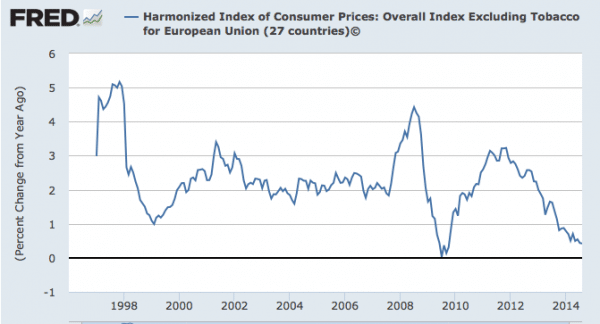 Price / wage adjustment within the Eurozone. A feature of the Eurozone is that if countries have different inflation rates / wage rates they become relatively uncompetitive. The striking thing is wage growth in Portugal, Ireland and Greece during the boom years. Usually countries with a higher inflation rate would see a depreciation in their exchange rate to restore competitiveness. However, in the Eurozone this cannot happen. Countries cannot rely on depreciation to make their exports competitive and this can lead to large current account deficits, lower exports and lower growth. Therefore countries who have become uncompetitive (e.g. 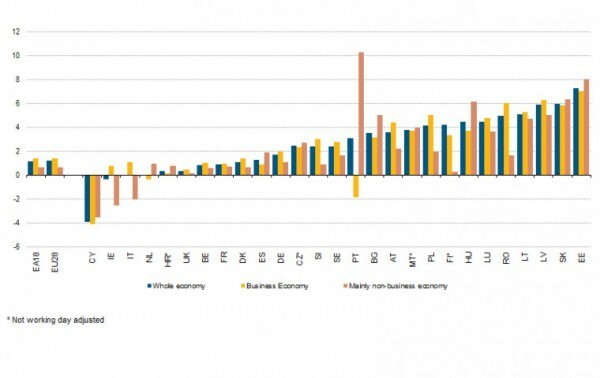 Spain, Portugal, Greece) need to rely on internal devaluation to restore competitiveness. Internal devaluation involves wage cuts / price cuts to become more competitive. The problem is that internal devaluation is painful – it can lead to lower economic growth, higher unemployment and a rising real debt burden. If the EU inflation rate was higher, then peripheral countries could restore competitiveness with low inflation – rather than outright deflation. If a country is 20% overvalued, this could take several years of deflationary pressure to restore competitiveness. In 2008/09 the UK saw a 20% fall in the value of the Pound – restoring competitiveness was very quick. But, restoring competitiveness through internal devaluation is a long, slow and painful process. It is harder to cut nominal wages than theory would suggest. 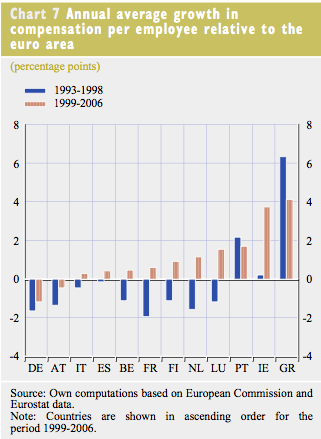 Debt deflation A significant problem facing the Eurozone is the high debt to GDP ratios. Deflation or even low inflation will see these ratios rise. This is because low inflation leads to lower nominal GDP growth and lower tax revenues. A feature of the crisis is the need for debt deleveraging (reducing debt). When people took out debt, there was an assumption of moderate growth and moderate inflation. If inflation comes in at below expectations, the real burden of the debt will be much greater than expected – leading to negative spiral of lower spending, lower growth causing more deflationary pressure and higher debt burden. Interest rates cannot fall below zero. Inflation of 0%, means monetary policy will be tighter than desirable. The recent economic crisis suggests that normal economic conditions of 2% inflation are insufficient to guarantee growth. The recovery in European GDP has been very muted. There has been resistance to nominal wage cuts. Despite high rates of unemployment in Europe, nominal wages have struggled to fall – as much as might be expected given high levels of unemployed workers and slack in the labour market. Higher inflation makes it easier for real wages to adjust and prevent real wage unemployment. 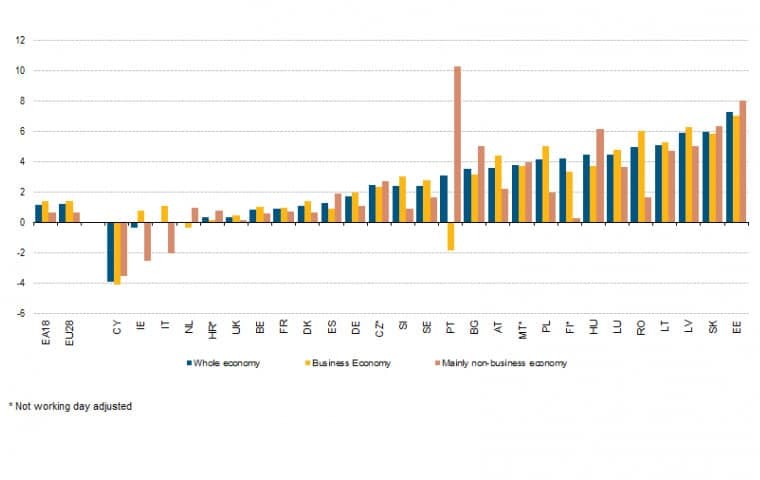 Excluding Cyprus (CY) – economies have not seen little fall in nominal wages, which might be needed to restore wage competitiveness with overall inflation of less than 1%. Economic growth. Deflation / very low inflation can hold back economic recovery. Allowing higher inflation will make it easier to target higher nominal GDP growth. A feature of the Japanese decade of low inflation/deflation is that inflation expectations became anchored at a very low rate. This made it very difficult for the Central Bank to later change inflation expectations. There is also a danger that the ECB could quickly lose its credibility for preventing low inflation / deflation because it lacks the action to back up concerns over falling prices. Europe is heading for deflation, but the ECB seem unable / unwilling to do anything drastic enough to change the situation. They are not able to do any real quantitative easing, interest rates are already at rock bottom and inflation expectations are tumbling. 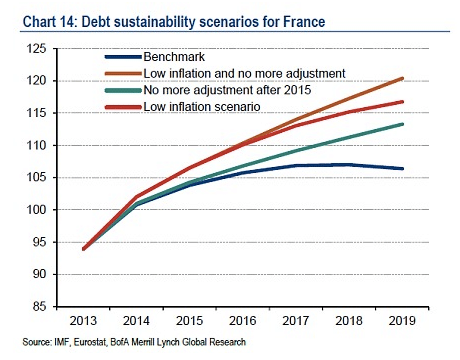 It will lock the Eurozone into a negative cycle of debt and deflation. 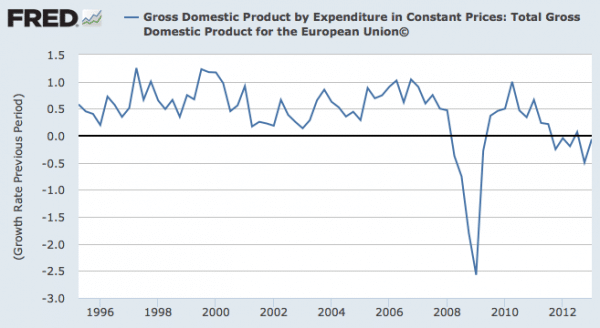 The Eurozone desperately needs prompt action – Q.E. targeting inflation of 3-4%, and a break from fiscal austerity. They need growth, but it is unlikely to happen. There are costs with higher inflation, but at the moment these costs are much smaller than the costs of a prolonged economic stagnation. Targeting higher inflation is not a panacea; it is not enough to guarantee economic growth, but could be part of the process to help the EU economy to recover. “Higher inflation would also help to contain and reduce government debt to GDP ratios – without excessive austerity.” No austerity whatever is needed to reduce the debt. To reduce the debt just print money and buy back the debt . As to any inflationary effects, deal with that via taxes. GDP would stay the same. No austerity. I’ve been banging on about this for years. In fact we’ve just employed the latter trick and on a huge scale via QE. But no seems to have noticed.